This week, HRC is in Indonesia, joining a group of Southeast Asian LGBTQ activists to meet with World Bank officials during the Bank's annual fall meetings. The meetings are an important opportunity to continue advancing the case for greater inclusion of LGBTQ people in World Bank-funded programs with Bank officials and other key policymakers. “With LGBTQ people under threat in so many countries around the globe, we must use every possible lever we have to help protect and defend their fundamental human rights," said HRC Global Director Ty Cobb. "The World Bank is just such a lever, and we look forward to seeing our advocacy yield more and more results at the Bank in the coming years." In order to make the case for greater inclusion, HRC is meeting with both Bank staff and U.S. government officials who help to set Bank policies. 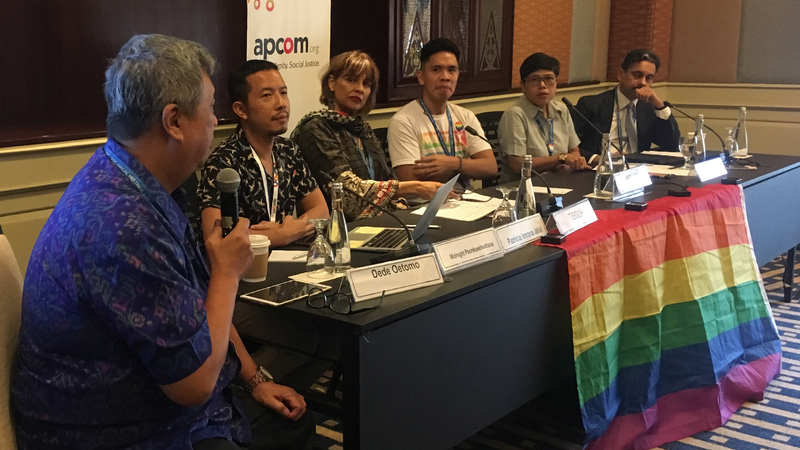 With local LGBTQ partner organizations like APCOM and GAYa NUSANTARA Foundation, HRC cosponsored an LGBTQ-focused event at the meetings called "SOGIESC Inclusion in Regional MDBs - Taking a Leaf Out of the World Bank's Playbook." The event featured stories from LGBTQ people from around the region and a panel discussion with Bank officials about how the World Bank and other development organizations can engage more to help address anti-LGBTQ discrimination. The World Bank has long been a chief focus for advocacy groups because of its enormous financial power and leverage. With an annual budget of more than $65 billion, the World Bank exerts a great deal of influence in its client countries, many of which have policies or laws that harshly target LGBTQ people. This means that even in a country where LGBTQ people are criminalized, the Bank can use its programs to set policies and standards that improve the environment for LGBTQ people and other vulnerable groups. If, for example, the Bank is funding an educational project, it can use its power to ensure that LGBTQ students are fully included in the program or that it works to stop bullying of children with diverse sexual orientations or gender identities. In recent years, due to the advocacy of HRC and other organizations, the Bank has taken a number of positive steps to advance LGBTQ inclusion, such as appointing a sexual orientation and gender identity advisor, and funding research into the economic well-being of LGBTQ people in certain countries. However, the Bank could take additional steps, like protecting LGBTQ people in its "safeguards" policies that recently took effect, which require both the Bank and its client countries to protect vulnerable people and the environment. HRC was disappointed when LGBTQ people were not included in those new policies due to objections from a number of anti-LGBTQ governments. For more information about HRC’s work to advance equality around the world, check out hrc.org/Global.